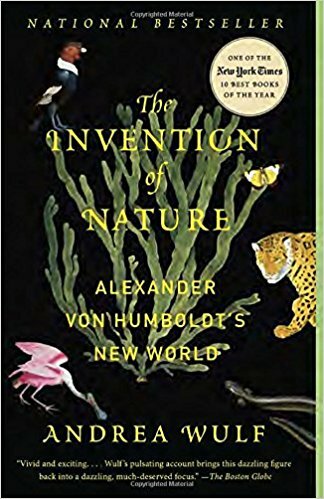 “The Invention of Nature” reveals the extraordinary life of the visionary German naturalist Alexander von Humboldt (1769-1859) and how he created the way we understand nature today. A Prussian naturalist, von Humboldt (1769–1859) has been largely forgotten in the English-speaking world,” writes Andrea Wulf in this thrilling new biography. “It is almost as though his ideas have become so manifest that the man behind them has disappeared.” Wulf’s book is as much a history of those ideas as it is of the man. The man may be lost but his ideas have never been more alive. Humboldt’s legacy appeared certain at the time of his death, when he was the most famous scientist in the world. His funeral in Berlin was the grandest ever accorded to a private German individual; a procession of tens of thousands of mourners followed for a mile behind his hearse, pulled by the king’s horses. American newspapers eulogized him as the “most remarkable man ever born” and lamented the end of the “age of Humboldt.” His portrait hung on the walls of state buildings from London to Bangkok. Though the man may be almost forgotten, his name lingers everywhere, from the Humboldt Current to the Humboldt penguin, Humboldt’s hog-nosed skunk, the Humboldt squid, and more than a hundred other animal species; Humboldt’s Lily; the minerals Humboldtit, Humboldtilith, and Humboldtin; Humboldt Limestone, the Humboldt Formation; Humboldt Redwoods State Park, Humboldt Mountain, Humboldt ranges in China, South Africa, and Antarctica; Humboldt Falls, thirteen Humboldt towns in North America alone, the Humboldt crater and Mare Humboldtianum on the moon, and on and on. More plants, animals, minerals, and places are named after Humboldt than anyone else. Humboldt was an intrepid explorer. His restless life was packed with adventure and discovery, whether climbing the highest volcanoes in the world, paddling down the Orinoco or racing through anthrax–infested Siberia. He explored Venezuela, Cuba, Mexico, Colombia, and Peru, visiting many regions never before observed by a scientist. He identified two thousand new plant species at a time when only six thousand species were known. He discovered the magnetic equator. He was the first European to explore and map the Casiquiare River, the only natural canal on earth to link two major river systems, the Orinoco and the Amazon. He was the first to conduct experiments on electric eels, which he dissected and held in his hands, enduring violent shocks. Humboldt carried this kind of hands-on experimentation to manic extremes in his voracious quest for total knowledge. He drank river water, chewed bark, copied and translated scientific manuscripts, made astronomical observations, gauged the blueness of the sky with a cyanometer, transcribed the vocabularies of indigenous tribes, and sketched Incan monuments and hieroglyphs of ancient civilizations deep in the Amazonian rainforest. He studied his own lice with a microscope. On the Chimborazo volcano, 17,000 feet above sea level, he crawled along a two-inch-wide ridge between a sheer icy cliff and a thousand-foot drop with “almost perpendicular walls…covered with rocks that protruded like knife blades.” He bathed in the Orinoco among crocodiles, gigantic boa constrictors, herds of capybaras, and jaguars. He contracted fevers, dysentery, blood infections, and nameless horrific Amazonian diseases. With his companion, he scaled every peak he could see in the Andes. When his shoes disintegrated, he continued barefoot. While traveling from Cuba he sailed straight into a hurricane, which lingered overhead for six days, inundating the ship so that the passengers had to swim through the captain’s cabin, while sharks circled in the turbid waters. Humboldt was, after all, as one contemporary said, ‘the greatest man since the Deluge’.” Now, through Wulf’s highly lauded book, we will discover this extraordinary man and his accomplishments for ourselves.